I was on the 05:28 HFD:PAD - standing everywhere past Reading (and possibly past Oxford, though it was at Reading I saw the overflow. Seat reservations in the bin as well - didn't affect me, but irksome for pax who've got one then to find it's worth nowt. Facilities on the 07:50 London Paddington to Great Malvern due 10:15. Will be formed of 5 coaches instead of 6. Facilities on the 10:59 Great Malvern to London Paddington due 13:29. 04:47 Hereford to London Paddington due 07:52 has been previously delayed, has been further delayed at Charlbury and is now 15 minutes late. 05:28 Hereford to London Paddington due 08:28 will be cancelled. Yesterday (12 November) the 13:22 Paddington to Worcester Foregate Street train departed Paddington 9 minutes late due to crew being delayed on an earlier service. This service lost further time & was 16 late at Evesham. Sometimes in such circumstances it's held there, & subsequently terminated at Worcester Shrub Hill, to let the 15:22 WOS:PAD service on to the single track first. Yesterday was not such a case. The result was significant delays on the following three London bound services: the 15:22 WOS:PAD ran non-stop from Oxford and arrived at Paddington 30 minutes late; the 15:51 WOF:PAD arrived at Paddington 25 late and the 15:14 Hereford to Paddington 19 late. On the other hand, the planners did ensure that the down services were largely unaffected, even running the 15:50 Paddington to Moreton-in-Marsh through to the Cotswolds. Which only goes to show that not re-doubling the whole Cotswold line was a mistake. I Think they are going too next year, just needs new junction at norton junction. Yesterday (12 November) the 13:22 Paddington to Worcester Foregate Street train departed Paddington 9 minutes late due to crew being delayed on an earlier service. I Think they are going to next year, just needs new junction at norton junction. Specifically the problem will be at Norton/Worcestershire Parkway. At the very least they need to re-double the few chains - it is literally less than half a mile - to Parkway (and obviously have two platforms on the London line). If they don't, trains will be held at Shrub Hill for late-running trains from London, and southbound connections to Cheltenham will be missed. If Parkway is to work, it needs to be an interchange station - not two stations that happen to be in the same place on different lines. 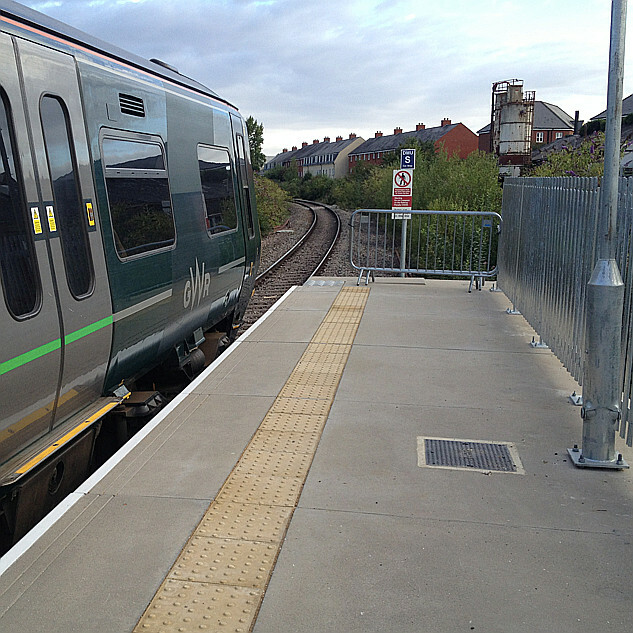 Seeing a major chunk of presentation on Worcestershire Parkway at the RailFuture Conference in Reading on Saturday, I suspect that a second platforms on the Cotswold line would add hugely to the station cost and be pretty darned difficult to do with access costs - I'm not sure if and how any passive provision has been made. Is there a valid assumption that trains will not run late ... your current late running train from London will never happen, will it, after the Elizabeth line has been completed, all those pesky HSTs have been replaced by IETs, Heathrow Western Access is open and the overhead masts at Goring have been painted green. ... Or in all seriousness, if performance can be improved, the need for contingency track for use in the event of timetable failure can be reduced. How about one LONG platform, Penryn Style, with trains from Worcester able to arrive and wait at the west end of the platform and make connections pending the arrival of the train from London at the east end? I'm not sure if and how any passive provision has been made. I believe passive provision has been made for second platform. Better performance may come. To be fair, the IETs - whatever their faults - are better suited to the frequent stops at one-horse towns. I was on the 2148 from Paddington last Thursday. The stop at Shipton was over two minutes. I have no idea if anyone got on or off - possibly neither. That one is a HST. 05:28 Hereford to London Paddington due 08:28 will no longer call at Charlbury and Hanborough. It has been delayed at Hereford and is now 14 minutes late. This can be a late decision leaving passengers at Charlbury and Hanborough standing on platform watching as their delayed train rushes past. And the double whammy is that if the 05:28 is running late, then the following 07:10 will be late departing from Moreton-in-Marsh adding to the delays. 05:11 Worcester Shrub Hill to London Paddington due 07:25 is being delayed between Ealing Broadway and London Paddington and is now expected to be 35 minutes late. Nothing on JourneyCheck but the 07:27 Moreton-in-Marsh to Didcot Parkway was started from Oxford "due to late running owing to following a late running preceding service (YD)". Not on JourneyCheck (needless to say) but the 07:10 Moreton-in-Marsh to Paddington was run with five coaches instead of nine today. As the previous service isn't running this week, it was already full and standing by Hanborough. 08:14 Moreton-in-Marsh to London Paddington due 09:46 will be cancelled. These through trains are very limited and I'm glad I don't have to go to London this week. The normal service from Shrub Hill has departures at 05:11, 05:37, 06:19 and 07:35, the last three starting at Hereford. There's two via-Cheltenham trains starting at Shrub Hill at 05:28 and 07:08 - but since these are (a) slower and (b) cost more, they don't really count. RTT is reporting this week as having through departures (via Cheltenham) at 05:28, 06:05 (from Hereford) and 07:08. Coming back from Paddington, there's usually Hereford departures at 17:22, 17:52 (Shrub Hill only), 18:22 and 19:22, with a via-Cheltenham at 19:48. This week this is down to 18:37 (Hereford) and then 19:48 (Shrub Hill only). So the "limited number of direct trains" from Hereford and Malvern would be more accurately described as "one direct train". Moral of story - never travel during periods of engineering works.